In high school, my friend did a science fair project on a plant’s exposure to certain types of music. She divided her plants into two groups. Each group of identical plants received the same amount of light, food, water, and nutrients. The only variables that differed were the types of music the plants were exposed to each day. One group grew heartily to the tunes of country music, while the other group died a slimy death to the beats of heavy metal. You don’t have to create an elaborate science fair project to know that music affects our mood, our movements, and feelings. It doesn’t take a leap to understand that our non-human animal counterparts are also affected by the sounds in their environments. It may, however, require a bit more science to explain how we can harness that awareness and help soothe our canine companions when the sounds that surround them are anything but lullabies. It seems the plants are on to something. Just in time for the loud summer celebrations on the horizon, here are two product reviews. Through the combined efforts of a psychoacoustician, an award-winning pianist, and a veterinary neurologist, a musical experience has been created that focuses on rhythm, pattern, and tone to create an auditory environment that is calming to our canine companions. You may already be experimenting in your household with psychoacoustics (“the study of the perception of sound”) and animal bioacoustics (“the study of sound in non-human animals. Both sounds they make and the effect of human-made noise on animals”) when you leave a radio playing for your dogs when you need to be away from them for a period of time. However, while classical musical in general tends to work as a stress reducer, music that is psychoacoustically arranged can be more effective at reducing stress and eliminating stress-induced behaviors for our canine counterparts. The CD comes with a great guide that details their BioAcoustic Research & Development (BARD) pilot studies conducted on dogs at humane societies, boarding facilities, veterinary hospitals, training facilities, and residencies. The guide included with the CD provides tips and techniques to properly introduce and use the CD while addressing specific issues like separation anxiety, thunderstorm anxiety, fireworks, boarding, and excitement with visitors. Pack Approval: Our boys Tristan & Grandbury settle down and go right to sleep when this CD is played. Grandbury has always been afraid of thunderstorms. As he ages, he has mellowed out a bit, but with this music he doesn’t notice a thing. I only wish we had come by this CD in his youth, for when he would awaken in the middle of the night and spin into panic mode, it often ended up with him trembling and clawing at our faces in an attempt to awaken us to alert of us of the impending doom of the storm. Tristan, a life-long sufferer from separation anxiety, has undoubtedly improved over the years, but in his advanced age he now displays CCD (Canine Cognitive Dysfunction) symptoms like twilight pacing. Two cruciate surgeries, arthritis, and muscle atrophy aren’t kind to a dog who has taken to olympic pacing. The CD truly helps him relax and keeps him off his feet. And Winni the cat? She takes her cues from her brothers and snoozes alongside them. What can I say? She is a cat who believes in her heart that she is a dog. Human Response: This CD makes me, an insomniac who has the inability to nap, begin to relax and desire nothing more than a few blissful moments of sleep. I’m planning on carting this in to my next dental appointment for a little relaxation assistance. The CD does come with a warning that one should not drive or operate heavy machinery while listening to the CD. For those of you wondering about our plants, all are doing well and none have died while being exposed to the tunes. We listened to the CD, Through A Dog’s Ear: Music to Calm Your Canine Companion, Vol. 1, and while we were introduced to the idea of psychoacoustically arranged music, the book further delves into the research behind the music and helps to explain why the music works to soothe your beloved canine. The book comes with a 45-minute “starter” CD that takes the research you read about and allows you to see it in a real-world application right in your living room. The enclosed CD contains selections from two music compilations, Music to Calm Your Canine Companion, Vols. 1 & 2, and Music for the Canine Household. The book explores the concept that humans and canines are not that different when it comes to the responses both exhibit when exposed to specific tones, rhythms, and patterns in music. As I said, the CD (Music to Calm Your Canine Companion, Vol. 1) makes me and my pack sleepy. Interestingly enough, the tempo of music that has the most profound effect on dogs is that which reflects the most “ideal relaxed heart rate” of a human. Think you’ll just turn on the classical station and your problems are solved? Think again. Classical music comes in many different variations and compositions. The one song that is playing now may be rhythmically calming and you and your pooch find yourselves beginning to nod off into dreamland when “BAM!” the next song begins with a jarring note that makes your pulse race and you find yourself driven to move, if only to turn the radio off. You’ve just experienced the difference and variation you don’t want to subject your pet to when you are attempting to create a calming environment for them. The Music to Calm Your Canine Companion CD has been arranged to reduce the heart rate “by progressively slowing rhythms and simplifying auditory data.” No jarring notes or loud cymbals here. The book helps the reader to seek out a balance between the clashing and confusing sounds of the human world as translated in the canine world. Our human activities and associated sounds can be extreme sources of confusion and fear for our companion animals. Fourth of July, anyone? The noises, smells, and vibrations that surround us are just loud and smelly events that confuse a dog. They have no frame of reference to place the activities and thus, the barrage of sounds and scents become assailants on our sensitive partners. They don’t know whether to run toward the noise and find out what it is or run away from it. Wait, then there is you, their beloved human to consider. Do you need protecting or warning? Their senses are overloaded and over-stimulated. Is the auditory environment we create for our companion animals the best suited for them? How are my companion animals responding to the noises and sound they are exposed to on a daily basis? What sounds make my pet agitated, stressed, happy, calm, or restful? The enclosed selections from Music for the Canine Household are perfect for those times when you want your companion animal to be relaxed but don’t want to be lulled to sleep yourself. The quicker tempos and upbeat selections provide an enjoyable and relaxing backdrop to the everyday. In addition to the research, the book is peppered with touching stories from animal lovers, making for an educational and enjoyable read. 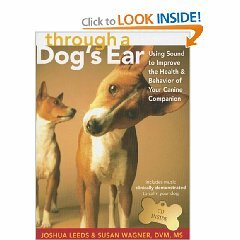 The book encourages the reader to look at music and sound as therapy for what ails you and your pet. The power of sound, especially music, is too often overlooked, but with this book and CD series, the pet parent now has a method and a means to create an environment that is pleasing and calming to the ear of their companion canines. We give both products a 5 Paw Rating, with 5 being the highest. How’d We Get Our Paws On It? Initially, we checked out from our local library. Why We Like It: educational, effective, portable, reliable, and a drug-free therapy to combat a number of issues pet parents encounter every day. The book comes with a CD that is anything but a demo or starter (it is 45 mins. in length). Room For Improvement: Honestly, we don’t have anything but the suggestion that they never stop producing these CD’s and continuing to conduct and share their research with the pet parents and animal organizations who strive to do better by our companion animals. To Sum It up: Take it from the insomniac and two geriatric dogs who have battled with separation anxiety, thunderstorm fear, over-stimulation from external forces, and periods of containment and rest dictated by surgical procedures–we wish we had come across this CD and book much earlier in our journey together. We might all have had more restful nights and a few less wrinkles too. As previous directors for an animal shelter, we encourage anyone in the animal welfare/rescue field to evaluate these products and use them to the benefit of the animals in your care. Take advantage of the Through a Dog’s Ear Shelter Program and receive Music to Calm Your Canine Companion, Vols. I-II (2 hours worth of music) for FREE, and you can further apply to receive free CD’s for your new adopters to take home with them (up to 200, w/ the option to continue to receive them at a generously reduced fee + the cost of shipping). We encourage you to read more about the research that went into the creation of these products. See the links below.